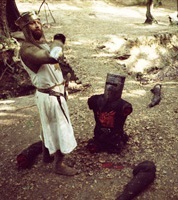 In one of the most memorable scenes from Monty Python and the Holy Grail, a character known only as the Black Knight engages King Arthur in a swordfight and quickly loses his arm in the duel. Undaunted, he continues the battle, even as the king chops off his other arm and then each of his legs. The Black Knight survives, but is reduced to a bloody stump of a man. I found the scene from this 1974 British comedy replaying in my head this week as I followed the New Hampshire Republican primary. Although former Massachusetts Gov. Mitt Romney won the contest and strengthened his frontrunner status, he suffered plenty of bumps and bruises in the Granite State. Unlike the Black Knight, he did not lose any limbs, but his victory did not come without a price. This entry was posted in Uncategorized and tagged Bain Capital, Black Knight, GOP primary, Mitt Romney, Monty Python and the Holy Grail on January 11, 2012 by Rich Lee.